On Sunday, it was 30 degrees. Thirty. Degrees!!! I felt almost instantly more human again. I did a ton of laundry, worked around the house, and headed over to the barn for some actual time with my horse. 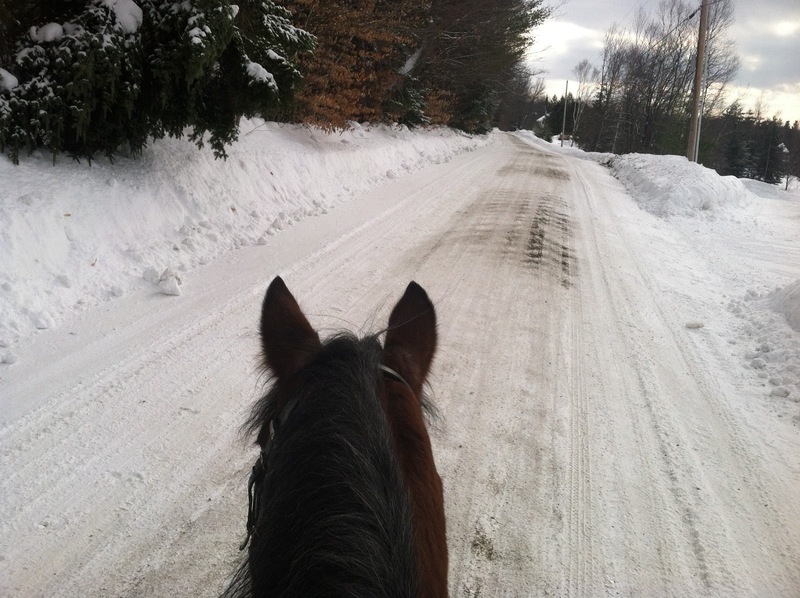 I tacked up and everything, and we went up and down the road for about 30 minutes. OUTSIDE! I rode him in one circuit of the outdoor ring, but he was less than enthused and I didn’t want him to strain himself. It’s one thing to ride through deep snow, but this had clearly drifted quite a lot in some places, and he was having trouble getting even steps. One step, fine, the next step, waaaaaay deeper, with no way to really see or tell which would be which. So we did the roads. There were horses in the turnouts just to the right who were deeply concerned that we were on the road. 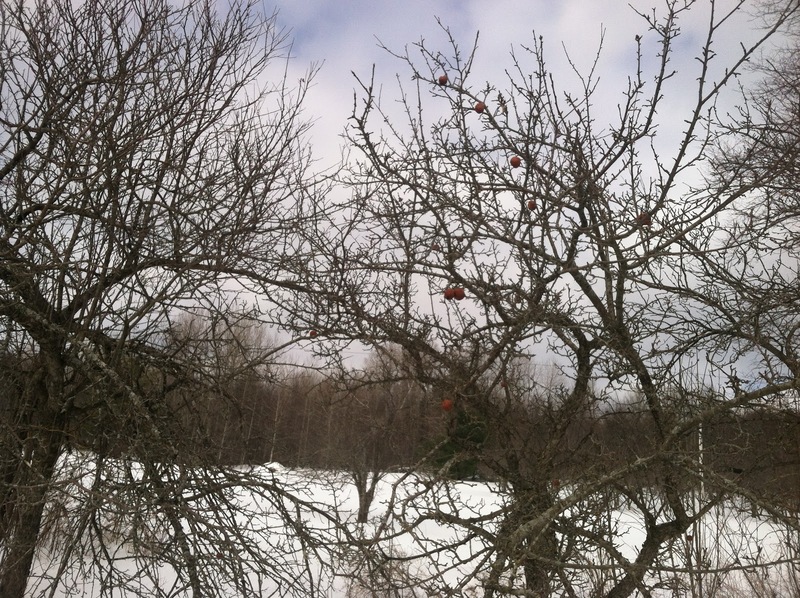 Winter apples, dried on the branch. 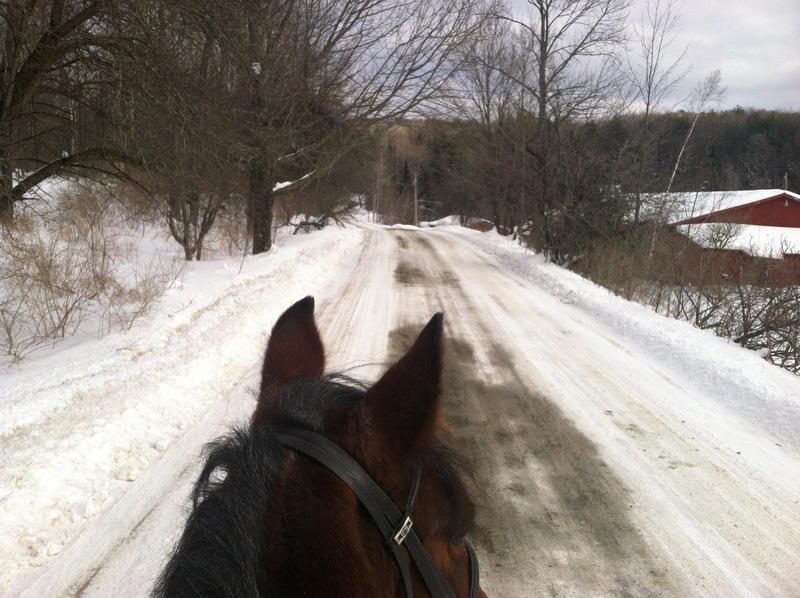 Road hacking in the winter is not without its travails, though. See the snow drifts on either side of the road? And the thicker snow? Down the middle of the road is the safest place to ride in some ways: it’s the most visible, and it’s the smoothest and flattest. On the other hand, it’s also the iciest, because it’s what melts first. So you’d think that it would be better, but right at the foot of those snow drifts are ditches, masked by lighter, fluffier snow that hasn’t settled and packed. So I tend to keep him down the middle of the road, and if it feels too icy – if he’s slipping too much, I head inside. On Sunday, the warmth and the sun kept the middle of the road just fine, slushy and a bit muddy. 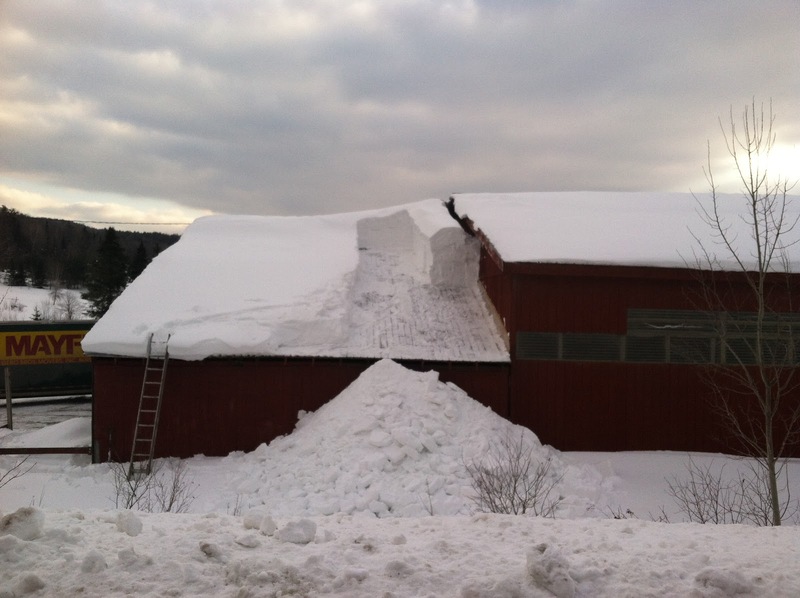 With so many indoors coming down lately, I was both worried and pleased to see someone on the roof digging snow off. Looking more closely, though, and chatting with the barn owner, it’s really just that corner, where the wind forces the snow into drifts. Removing the load in that corner made a huge difference. In all, a nice ride and a productive day. Now we’re back to low single digits, though, so back inside for me.